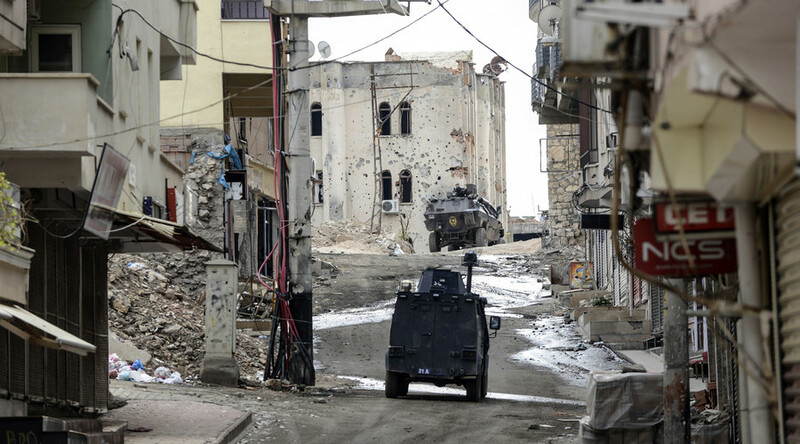 Armored vehicles patrolling the streets, reports of starvation looming and civilians killed - a small pro-Kurdish town of Silvan has become a hotspot after the Turkish military launched an operation on November 3. The curfew has entered its second week. The city neighborhoods of Tekel, Mescit and Konak have been mostly hit by the shelling as journalists at the scene reported of shattered glass, debris in the streets and bullet-riddled buildings. HDP deputy Ziya Pir claimed an official from the Interior Ministry told them that the security forces “will erase three Silvan neighborhoods from the map,” as cited by Evrensel newspaper. Several people have been killed since the curfew was launched in the city on November 3. AFP reported seven casualties, which included two civilians and a policeman. Local IMC news website said that a small boy was killed in the shelling. “You can be killed while drinking tea or while going to buy bread by snipers or police vehicles in Silvan,” another deputy from the HDP, Çaglar Demirel, said. Peoples' Democratic Party (HDP) lawmaker Sibel Yigitalp told AFP that Turkish soldiers have been randomly shelling civilian homes in Silvan. “We are concerned about their lives. They cannot even meet their basic needs under the curfew. There is no power and clean water,” Yigitalp said. The city of Silvan (population 43,000) has seen clashes between Turkish forces and members of the Kurdistan Workers Party (PKK) since August this year. The PKK, founded in 1978, has been fighting the Turkish state since 1984 for the Kurdish self-determination. Kurds make up 10-25 percent of Turkey’s population. PKK is considered as a terrorist organization by Turkey, the US and NATO. In October, Ankara deployed armored vehicles and helicopters in Silvan. At least 17 PKK were killed as a result of the operation. “If you look at the pictures from the town of Silvan now it looks as if you were looking at pictures from the town of Aleppo [Syria] or any other war-torn city in Syria,” Middle East political risk analysts Shwan Zulal told RT.